An article written by the National Institute on Health indicates that as women age, loss of bone density occurs affecting the jawbone. When the density of the jawbone is affected, teeth begin to loosen and shift causing the face to change in appearance and leading to permanent tooth loss. When the jawbone is stimulated, it maintains its bone density and form. 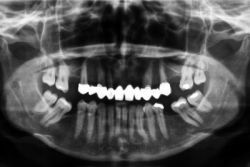 Tooth loss resulting from a decrease in bone density or bone disease can cause even more rapid bone loss if not stabilized by dental implants for bone stimulation. If you’ve lost a tooth, or several teeth, the path to regeneration of the jawbone will become more difficult as time passes. If you have osteoporosis, even adhesive dentures will not offer a long term solution as the bone continues to rapidly deteriorate preventing dentures from fitting properly and ultimately causing gum irritation and continued rapid bone loss. Once you have realized that your teeth are loosening, it’s imperative to visit your dental implant specialist, New Jersey top dentist, Dr. Ron Rotem. Many women will take supplements to help minimize the effects of diminishing bone density. However, bone stimulation through dental implants is your best solution for preventing face changing bone loss in the jaw. The Dental Implant is the only solution that duplicates the natural root of the tooth with secure and firm adhesion to the jaw stimulating the bone for a long term healthy solution for good oral health. Call Ocean County cosmetic dentist, Dr. Ron Rotem for the best solutions to natural tooth replacement before diminishing bone density causes embarrassing and unhealthy tooth loss.